I’ve Got My Love to Keep Me Warm is a wintry treat from Tamar: hear her resist the freezing eddies swirling about her. The band plays boreal gusts to send off Dennis's clarinet. Then it’s Tamar’s vocal strings and Rob’s bass in a little fireside chat—perhaps gently debating whether to go out or stay in? In the final chorus, Tamar can no longer resist, but is swept off her feet and spirals like a snowflake in the storm! The ending contains a tip-of-my-hat to Rimsky-Korsakov. ’Zat You, Santa Claus? is the illegitimate offspring of Mrs. Claus and Count Chocula—a world-crossing child heir to both Halloween and Christmas. Isn’t it logical, after all? Isn’t it a bit creepy that a complete stranger, a bearded elderly overweight gentleman (in the movies that would read grizzly old homicidal maniac who has escaped from the asylum next door) breaks into our homes while we’re asleep, judges us, and dispenses rewards or punishments at will? Louis Armstrong made a playful hit of this song in 1953 with the Commanders; here, Tamar is the tormented victim shivering in the night. Those tiptoes outside are just Rob's bow—or are they?? It’s Beginning to Look a Lot Like Christmas is our up-and-downhill sled ride for swing dancers. Fittingly, we debuted this version, which alternates single and double-time feel, at the New York City vintage subway train ride in 2010 (video here). And let us tell you: hanging on for dear life while playing aboard that old subway was quite a ride!—As we hope our version of this classic is. Molly is first at the reins, then Dennis's nimble clarinet, then yes, that is Gordon trading with himself. Near the end our sled barrels down hills and shoots off of snow-ramps—hear that air time? Santa Claus is Coming to Town, and he’s bringing a big band—at least that’s our spin on the tale. Here the horns harmonize in a mini-big band style, playing short send-offs and tags (with some modern jazz harmony) for Molly, Gordon, Matt, and Nick. Incidentally, one of the co-composers of this song, John Frederick “Jack” Coots, was the grandfather of Danny Coots, a great modern-day swing and traditional jazz drummer. In other news, don’t forget to take Molly’s advice! March of the Toys, from Victor Herbert’s 1903 operetta Babes in Toyland, has been a long-time favorite of my family’s annual holiday band. 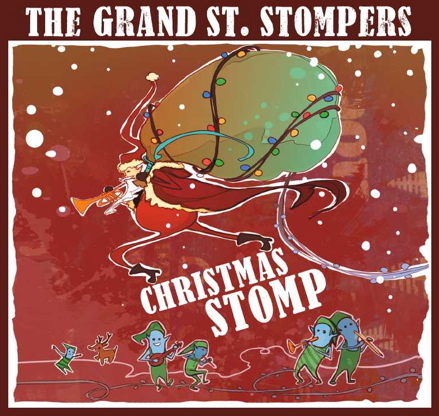 Here, in its full-fledged glory, it has a martial call to arms, a strut led by Dennis and his magical double clarinets, Matt and his trombone fronting a parade down Main St., and finally, in New Orleans tradition, a breakdown into joyous swing. Check out Matt’s solo, Paul Desmond-like in its patient lyricism, after which Dennis and Kevin channel Benny Goodman and Gene Krupa; Gordon then swings those toy soldiers southward for a bit of shore leave in Brazil—or at least in the land of fake surdo drums and agogo bells, if only for a moment. I Saw Mommy Kissing Santa Claus is mischievous Molly at her best—perhaps learning from Mommy? You can hear her grinning with delight on the stairs as she sings about her mother fancying her “tucked up in my bedroom fast asleep.” Seriously. Listen to that line and you hear her smile—it’s amazing. Then it’s Gordon's silky cornet dancing with the horns downstairs, Nick’s guitar lines festooned in perfect holiday catenaries, Matt tiptoeing around trying to glimpse the tryst, and Kevin Claus whirling Mommy about the room with his groovy beats. Like Molly, you’ll be smiling for days afterwards. The Only Thing I Want For Christmas, perhaps only the second tune on this album our listeners might not know, is a Depression-era holiday tune that Eddie Cantor sang on the radio in 1939. Here we preserve the original spoken introduction, with names changed to protect the innocent. Tamar reminds us of those things which really matter, Matt provides some thoughtful reflection on trombone, Gordon sighs lovely things on the cornet (with nods to Ruby Braff) to Nick’s earthy accompaniment, and Rob’s bass offers wise words. Tamar and a caroling brass band stops by your door at dusk. O Holy Night dates to 1847, when Adolphe Adam took a poem called “Minuit, chrétiens” (Come, Christians), written by a wine merchant and sometimes-poet Placide Cappeau, set it to music, and called it Cantique de Noël. Despite its advanced age, its melody and harmony are still nothing short of fascinating today. In this instrumental outing, we feature just about everyone in the band, and cap it all with a glorious chorale ending. All the Other Christmas Songs was the focus of our Holiday Challenge contest: “This track is remarkable in that it is made up entirely of bits and pieces of famous holiday and winter-themed songs, all chopped up and mixed together. A micro-medley, a musical smoothie, if you will. This contest, then, is a taste test: if you think you know your holiday tunes, then we challenge you to drink of this musical smoothie and use your aural taste buds to name each song it contains, and furthermore, in the correct order.” We went on to issue a grand prize challenge, which required entrants to write out the correct lyrics—a feat which requires considerable insanity to accomplish. An added bonus of this song is that it’s very hard to accuse us of forgetting to include your favorite holiday tune on this album. Special thanks once again to the musicians, to our engineer Peter Karl, intrepid photographer Lynn Redmile, and artists Melissa Pagluica and Brandon Au; to Kevin McEvoy & Barbara Epstein for their generous support; to Michael Steinman of music blog Jazz Lives for his unending enthusiasm and unflagging eye and ear; to our families, friends, fellow artists, venue managers & organizers, and others who donated advice, time, money, and spirit; and most importantly, to our wonderful fans! Merry Christmas, and keep on stomping!